Hospital-Type Cleaner/Disinfectant With A Fresh Lemon Fragrance Offers A One-Step Solution With An Elevated Ph To Effectively Clean A Variety Of Hard Surfaces, Including Toilet Bowls And Urinals. Concentrated Formula Is Effective Against Ca-Mrsa, Norovirus, Canine Parvovirus, Hiv-1 And More. 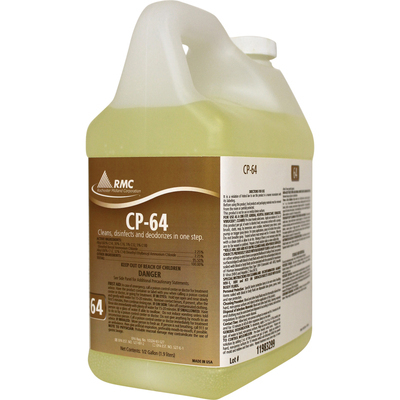 Cp-64 Cleaner/Disinfectant Is Designed For Use With The Rcm Ez-Mix Dispenser (Sold Separately). Dilute At 2 Oz. Per Gallon (1:64)..
Hospital-Type Cleaner/Disinfectant With A Fresh Lemon Fragrance Offers A One-Step Solution With An Elevated Ph To Effectively Clean A Variety Of Hard Surfaces, Including Toilet Bowls And Urinals. Concentrated Formula Is Effective Against Ca-Mrsa, Norovirus, Canine Parvovirus, Hiv-1 And More. Cp-64 Cleaner/Disinfectant Is Designed For Use With The Rcm Ez-Mix Dispenser (Sold Separately). Dilute At 2 Oz. Per Gallon (1:64).